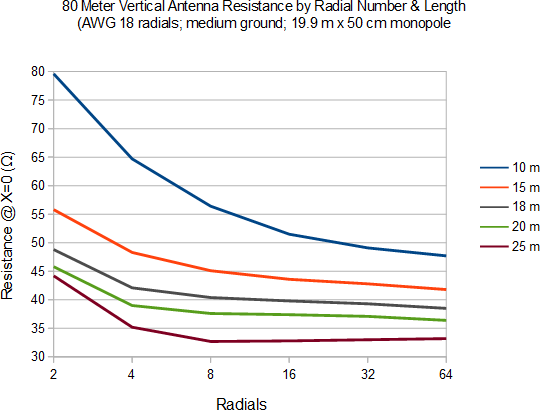 We all know -- or should know by now -- that for ground-mounted vertical antennas the more radials the better. Specifically, more and longer radials reduce the near field ground losses by confining antenna return currents to the highly-conductive radials rather than the lossy ground below. That is, a good radial system forms a low loss ground plane. This is highly desirable since ground loss can be substantial. This is a shame since vertical antennas can be excellent radiators at the low elevation angles needed for effective DXing on the lower HF bands which is difficult to achieve with horizontally polarized antennas. A lot of wire and ground area is required to construct a good radial system which is impractical for most hams, and so they must compromise. That compromise may be short radials, few radials or avoid vertical antennas entirely. But for this exercise let's assume you are building a ground-mounted vertical and radial system. I'll do this for 80 meters since that's the antenna currently of interest to me. The data can be scaled to other bands if that's your interest. I will further assume that you are comfortable with the data and theory regarding near field and far field ground loss associated with verticals and vertically polarized antennas. If not there are ample and excellent resources available to you. Perhaps some of the best can be found on N6LF's web site and in ON4UN's book Low-Band Dxing. I addressed a few of these elementary items in my own small way, such as here and here. In this article I want to focus on the effect of radials on the resonance of a ground-mounted vertical. The reason is that I am currently dealing with this issue and I have not found any easily digestible material out there that describes just what happens. In particular what it means when we say that radials tend to "resonant" when there are few and "non-resonant" when there are many. Even with the real ground models used in EZNEC there are ground loss and velocity factor inaccuracies with on-ground radials. As the radial count increases the effects will diminish but are still difficult to quantify. Ground is not homogeneous yet the model must assume that it is. At low frequencies the antennas fields can penetrate many meters into the ground, so what you can't see can hurt you. Radials cannot touch the ground or be placed below the surface. They must be placed a small distance above ground for the model to work, which contribute to inaccurate calculation of ground loss and radial velocity factor. Monopoles constructed with an open lattice tower cannot be directly modelled and must rely on a substitute "effective diameter". Determining the effective diameter is difficult and is more difficult yet for tapered towers, such as the one I am using in my 80 meter array, where a stepped diameter correction is impractical. It almost inevitably requires post-construction measurements and adjustments to the height to achieve the desired resonance. The feed point of a real tower vertical is located within the tower base. Since the model can't deal with that there will a difference in effective lengths of the radials and monopole. Despite these challenges a NEC2 model will still deliver excellent insights into vertical antenna design when developed with care. Although there will certainly be inaccuracies in the results the general trends and behaviours can be correct and useful. For my model I am using the following parameters. You can adjust these as necessary to suit your own requirements for design and construction. Better yet, if you can afford it, use NEC4. Monopole height of 19.9 meters and effective monopole diameter of 50 cm (20"). AWG 18 insulated wire for radials. Radials and monopole raised 10 cm (0.0012λ) above EZNEC medium ground. Segment length of ~1.0 meters. It is desirable to equalize the segment length of radials and monopole for model reliability. The model was run for a range of lengths and numbers of radials. The data collected is resonant frequency (X = 0) and feed point resistance at the resonant frequency. Radial length is varied from 10 through 25 meters, which covers lengths that are both above and below the resonant frequency. Radial counts are: 2, 4, 8, 16, 32 and 64. Doubling radials at each step is most illustrative since the effects are not proportional to the number of radials. 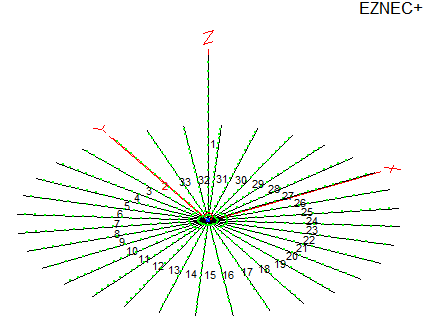 The only quirk I encountered was with 64 × 25 meter long radials which exceeded the1,500 segment limit in my version of EZNEC. For that one case I was compelled to use just 58 radials. In the left chart the transition from resonance to non-resonance is plainly obvious for all radial lengths as the radial count increases. Notice how in all cases the resonant frequency regardless of whether the radials are shorter or longer than resonance. However the greater the radial length departs from resonance the more radials it takes to converge to the ultimate resonance that is approximately 3.680 MHz. I added the 18 meter length radial data since that is the closest integral value that keeps the antenna resonance static with respect to radial count. The true value is closer to 17.5 meters, which would have required violating my rule of keeping segment length constant at 1 meter. The implied velocity factor for the radials due to ground proximity is ~0.89 plus a further 0.02 reduction due to wire insulation. The true velocity factor is almost certainly lower when radials rest on or slightly below ground. As discussed above this cannot be fully modelled with NEC2. Expect the measured velocity factor be no higher than 0.75: radials resonant at 15 meters length or less. The story for feed point impedance is more complicated. N6LF addresses this matter in detail so I will not delve into the topic too deeply. High feed point resistance is a indicator of excessive ground loss, which is not surprising to see for short radials even when there are many of them. Many radials can only partially compensate for short length. For long radials the lower feed point resistance is not a reliable indication of lower radiation resistance or ground loss. As N6LF demonstrates the current peak moves outward from the feed point when the electrical length of the radial is greater than ¼λ which changes the character of the entire antenna. By expecting a final feed point impedance for your vertical antenna or array you will be better equipped to plan ahead for a matching network, rather than merely hoping for a perfect match or stopping when one is reached despite it being a symptom of high ground loss or less than optimal radial currents. Requiring an L-network for a vertical network should be seen as a nice problem to have. When your chosen radial length is substantially unequal to a ¼λ you should expect unusual resonant frequencies when you first attach a few radials and then large changes as you add more. Forearmed is forewarned so the charts above can help you to anticipate and to avoid surprises. Certainly this happened when I first lit up my 80 meter vertical a few days ago! Had I chose shorter radials the effect could have been the opposite of what I measured, with resonance occurring above my design frequency and then falling lower as radials are added. To give a more concrete example, when I attached a long on-the-ground length of RG213 back to the antenna switch the resonance shifted upward to 3.5 MHz from 3.4 MHz. With only 4 radials the outer surface of the coax acts as a unreasonably long fifth radial and that disturbs the symmetry of the other 4. This resonance effect would largely disappear with a radial count of 16 or higher. However this is distinct from common mode current on the coax surface, a separate though related problem. It was these experiences that motivated me to run the models and write this article. Nowhere that I could find was there a quantitative or visual presentation of the precise migration of vertical resonance with radial length and count. My thought is that if these models are helpful to me it may be helpful to you for the design of vertical antennas and the gradual deployment of radials. I certainly won't wait until there are 64 radials before I try an antenna. I doubt that any ham would! 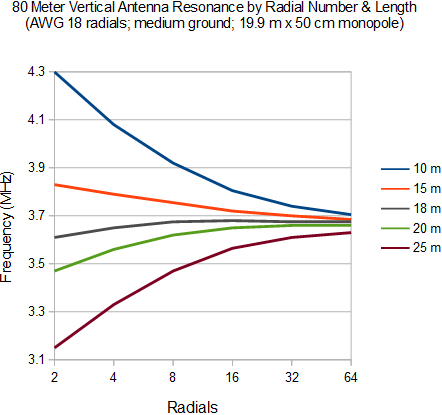 Rely on those referenced resources and others to plan your vertical antennas to achieve the optimum number and length of radials for your individual circumstances and performance objectives. Models will help as well, provided that you take account of modelling software constraints and limitations. It is my hope with this article that I've provided one point of insight into the process.